There are currently two design strategies evolving in high performance buildings. One is increasing the mass inside of a home to aid in thermal storage and the other is low thermal mass (Passive House) to aid in time-of-use heating strategies. The refurbishment of the Off Grid Learning Centre allows for both scenarios to be investigated within the context of a single high performance building envelope. 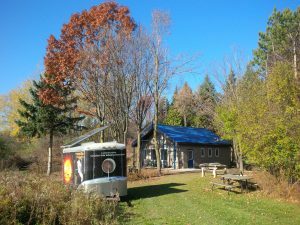 The passive solar design of the Centre includes optimized light transmittance coatings on the windows based on their orientation, which allows the building to absorb beneficial solar gains in winter while minimizing unwanted summertime gains. Based on recent building energy simulations, the Off Grid Learning Centre will require 82% less energy for space heating on an annual basis relative to existing standard homes. The Centre now receives power from local renewable sources: the Living City Campus’s 720 Watt solar photovoltaic system and 350 Watt wind turbine (with power stored in a 13 kWh battery array). The building can operate on the small power generation system because electricity is not used for the building’s themal loads, reserving all power for lights, appliances, plug loads, fans, and pumps. Domestic hot water is heated using liquid solar thermal collectors and stored in a small tank. Space heating will be provided with a small wood-fired pellet stove (30 Kbtu/hr) when necessary, and space cooling will be provided through fresh ventilation air that is pre-cooled by a water loop submerged in a cold well. By connecting a sub-soil heat exchanger to the energy recover ventilator, this system will extract up to 3.5 kW of heat continuously from incoming air, providing a cool space during summer while maintaining good air quality and using very little electricity. The now complete Off Grid Learning Centre will serve as a new Living Lab to be used by academic and industry research partners involved in advanced building design to answer building science questions regarding innovative, high performance, building envelopes.